It’s icy pole season again! Summer is almost upon us and it wouldn’t be an Aussie summer without sitting on the trampoline with an icy pole. Kids adore them and they can be a great way for everyone to cool down. Every year we see more and more products claiming to be healthy on the supermarket shelves. Icy poles are no exception! Finding which icy poles (or any food for that matter) is actually a good choice isn’t as simple as finding the one with the lowest kilojoules (calories). We also need to consider the other ingredients (sugars, additives etc) and the amount of whole food ingredients; as these are the ones that give us nutrients! 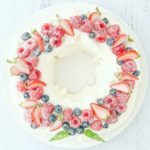 I have done a quick round up of some of the most popular choices available from Coles and Woolworths (some from the freezer and some from the shelf-stable dessert section). I have considered the ingredients and the amount of sugar per 100g (for even comparison). They are very loosely arranged in order. My tick of approval show the ones I would be happy to see in your trolley regularly. None of these icy poles are health foods, and none are forbidden or toxic if you want to have one as a treat! I am sure that no-one is in denial that zooper doopers are a healthy choice. I thought I’d include them here for comparison sake. 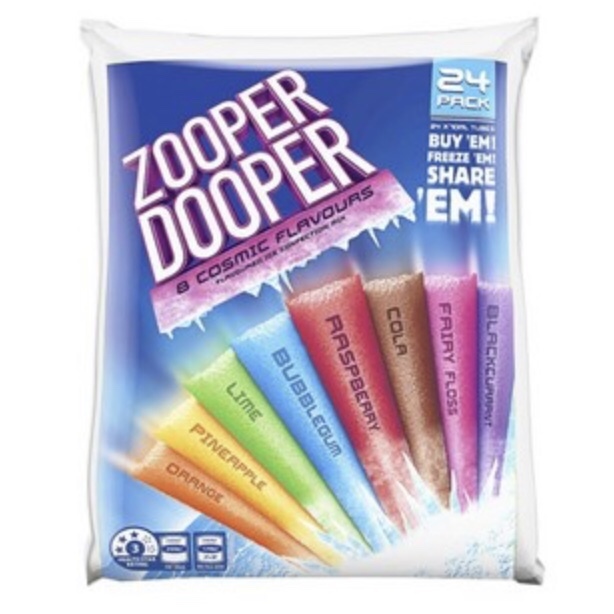 A zooper dooper icy pole is just flavoured sugar water. A single zooper dooper has 2 1/2 vteaspoons of sugar and no fruit or other nutrients. We shouldn’t be having any more than 6 teaspoons of added sugar a day (and non for under 2s) so one of these sweet treats is going to mean you need to be really careful with your intake for the rest of the day. This one doesn’t have any benefits I can talk up. When assessing how healthy something is, I can’t help but take away points for a product that is on the ‘health food’ bandwagon and claims to be healthy when it doesn’t have anything good to offer. Sugar Freezies get the wooden spoon award from me. These icy poles are made with just water, sweeteners and flavours. They’re just flavoured water. Yes, they’re added sugar free. But they are sweetened with stevia and the sugar alcohols, erythritol and maltitol. Stevia is natural in that it comes from a plant; but so does regular sugar from the cane plant! Stevia is very low in energy but still undergoes chemical processes to extract it. Sugar alcohols aren’t regulary alcohol, they’re carbohydrate that provide much less energy (kilojoules) than table sugar. We get hardly any energy from erythritol but maltitol still effects blood sugar levels. Sugar alcohols can cause tummy problems in some people, especially if you have IBS. It’s great that they have moved from artificial to natural sweeteners, colours and flavours (especially if you have allergies or intolerances to additives in your household). While low in energy and added sugars, these natural sweeteners don’t improve the quality of foods (in the way of wholefood ingredients which are high in nutrients) or address our reliance on sweetened foods in general. While these sugar freezies want to be a healthier option, they aren’t actually providing any nutrients or benefits. They are reinforcing the message that we need our foods and drinks to be sweetened. Reconstituted Fruit Juice (49%) (Pineapple, Orange, Passionfruit), Water, Sugar, Glucose Syrup (Wheat), Food Acid (300), Vegetable Gum (412), Color (160b), Flavours. Food acid 300 is just ascorbic acid, vitamin C. It is a natural preservative. 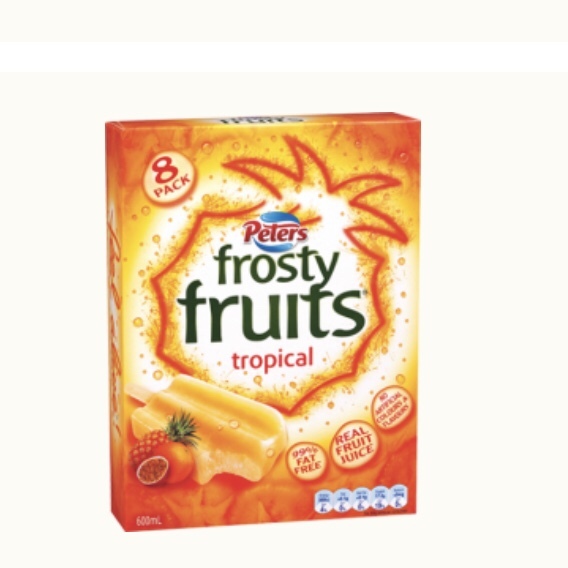 While Frosty Fruits promote the fact they’re made with real fruit juice, they’re not just fruit juice. They’re a 50/50 mix of fruit juice and sugar water. 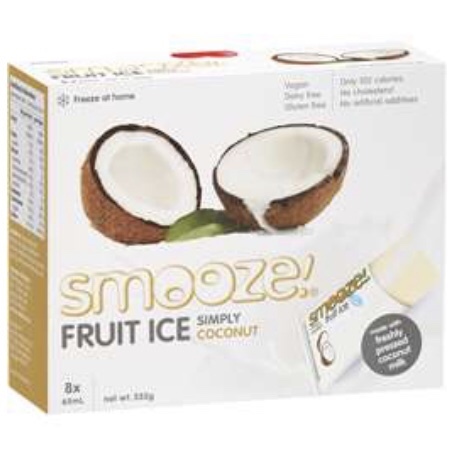 Smooze fruit ice are found on the shelf in the dessert section of the supermarket. The only use natural flavours and have a coconut milk base. Ingredients: Coconut Milk 80%, Natural Cane Sugar, Maltodextrin, Fructose, Stabilisers (Tara Gum, Xanthan Gum), Natural Coconut Flavouring, Salt. These ones use only natural flavourings which is a good thing. Coconut milk isn’t nearly as nutritious as the flesh, but you’ll still get some trace minerals. Smooze Fruit Ice are still high in added sugars and the gums can cause gastrointestinal upset in some people (especially those who have allergies to dairy, soy, wheat or corn). There is also a mango and coconut flavour which is 48% mango juice and 40% coconut milk. This is a slightly better option with some additional nutrients from the mango juice. Tick of approval: Not every day, but they make a decent sugary treat for most people. I understand why these are popular. Their in a plastic tube that kids lovely and the real fruit juice means they’re an obviously healthier choice over Zooper Doopers. 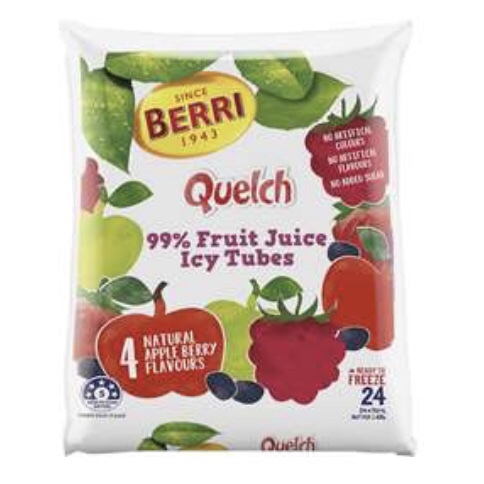 Ingredients: Reconstiuted Fruit Juices( Apple (93.2%), Grape (3.2%), Pear (1%), Orange(0.5%), Pineapple (0.5%), Passionfruit (0.3%), Mango(0.2%), Blackcurrant (0.1%), Colours (102, 110, 150d, 163), Flavours, Thickener (466), Preservatives (202, 211, 223), Food Acid (Citirc Acid). 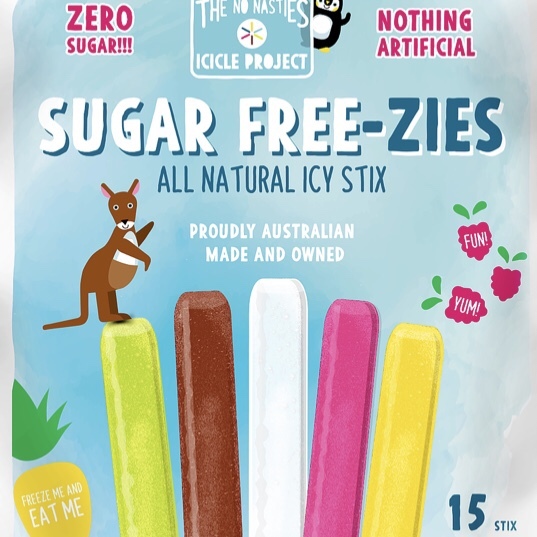 While these icy poles are mainly fruit juice, they still have added colours, flavours, thickeners and preservatives. If you’re not sensitive, then a small amount of additives like this occasionally won’t cause you any harm. These are a decent choice, but save them for special occasional (only putting them in the freezer a few at a time) and not every day eating. Ingredients (Berry Passionate): Packham Pear Juice (91%), Raspberry Puree (4%), Strawberry Puree (2.5%), Passionfruit Juice (2%), Elderberry Extract (0.1%), Food Acid (Citric Acid). Even without the additives, fruit juices do count towards your daily intake of added sugars. 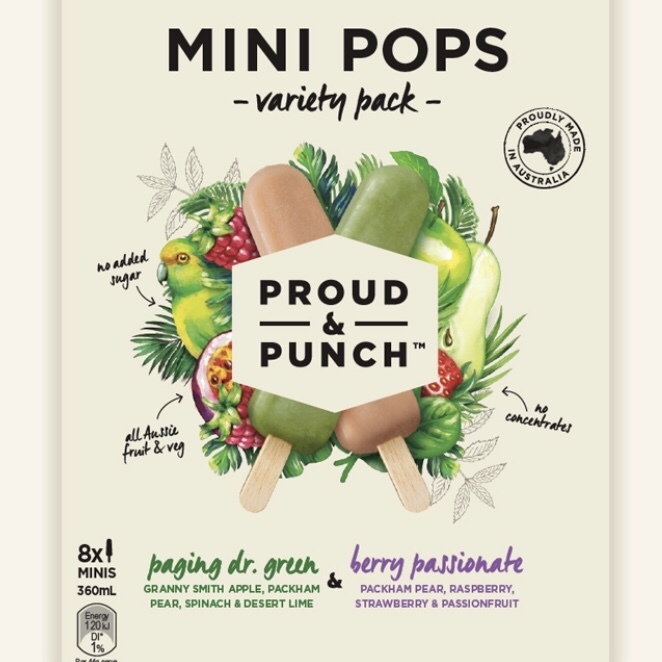 A regular sized Proud and Punch icy pole will add 2 teaspoons towards your intake, but you are still getting some benefit (vitamins and minerals) from the fruit juices and a tiny bit of fibre from the puree. Of course, I have to give you the best option of them all and that is to make your own! I know what you’re thinking, but it really is so easy. My favourite way is blending fruit in a blender or food processor. You’ll need icy pole moulds but you can pick these up from Kmart and Ikea. You can also use ice cube trays. 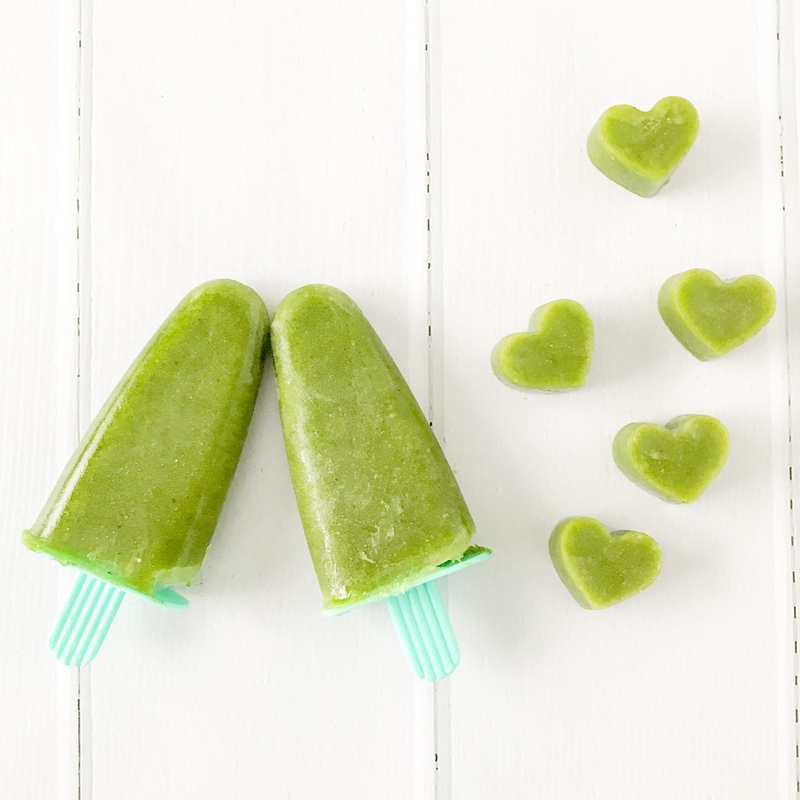 Check out my favourite green smoothie ice pops and my other favourite homemade healthy icy poles. At the moment our favourite combination is water melon, frozen mixed berries and mint. 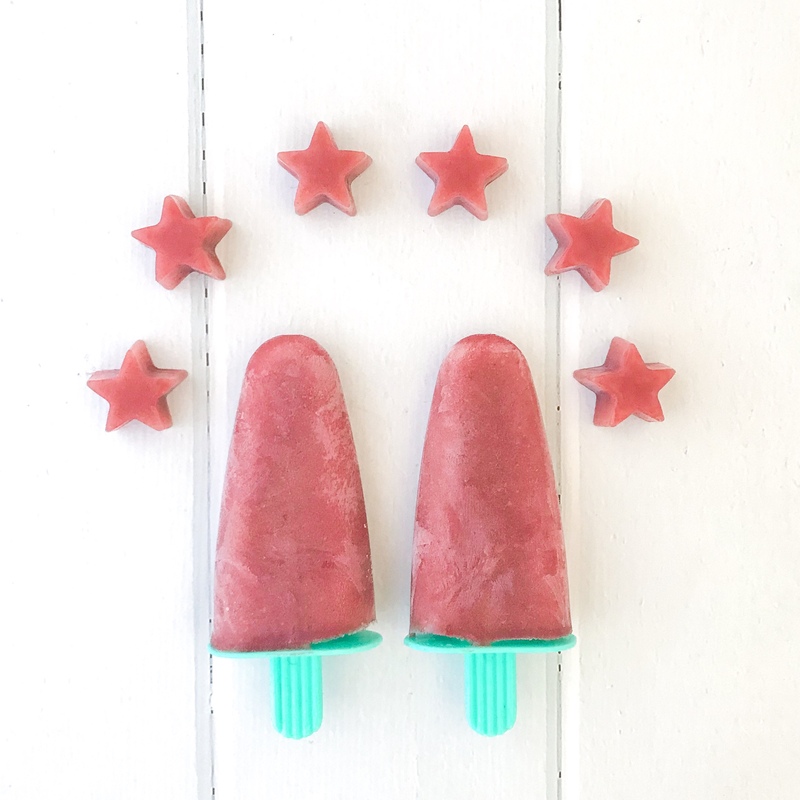 Blending whole fruit for home made icy poles means you get all the fibre from the fruit too so the sugars are truly natural (in their natural form) and won’t contribute to your added sugar allowance. it will normalise adding vegetables to things (which is very important for raising healthy eaters!). 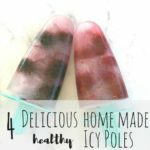 You can also make your own healthy icy poles with 100% fruit juice. This option obviously lacks the fibre content of icy pole ‘smoothies’ but it is still a healthy and cost-effective option for a treat with no other additives or plastic wrapping. Remember, that when we eat healthy whole foods most of the time, there is room the occasional treat. Treats don’t have to be the healthiest of the bunch. But if your family enjoys icy poles often, it is worth making the switch to something a little more nourishing. Happy icy pole making and shopping! Sarah Moore is a mum, and university qualified Registered Nutritionist. She ha over a decade of experience working with families to improve their health and well-being. Sarah has a simplistic and practical approach to family nutrition and offers private consultations and group education sessions in Perth, Western Australia. You can find her on Facebook and Instagram for more healthy tips and tricks.